Halley's Comet comes around once every 75 years, but in between it likes to put on a show with meteor showers that broke off the comet centuries ago and can be seen from Earth each year. 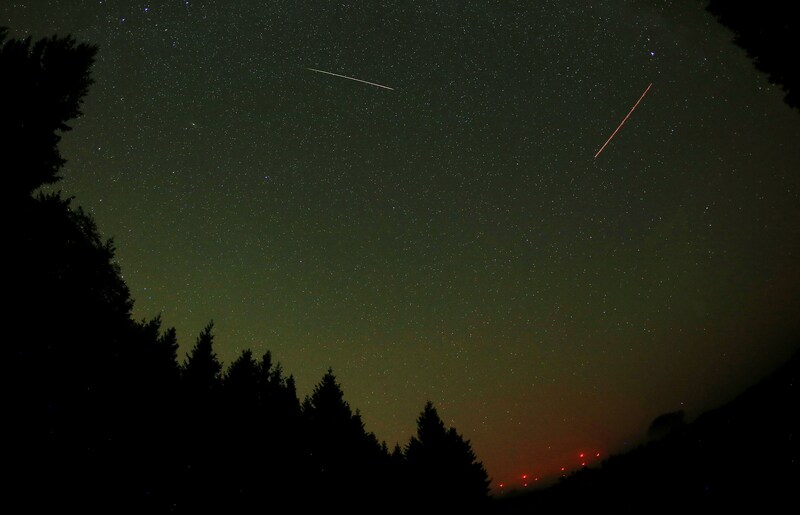 So how can you see the Eta Aquarids meteor shower this week? Well, the good news is, it's pretty manageable. The Eta Aquarids happen every year during late April and most of May, but they're typically most visible on or around May 6. The meteors in question broke off from Halley's Comet hundreds of years ago; they get their name from the star Eta Aquarii, one of the brightest stars in the Aquarius constellation, from which the meteors seem to emerge in the night sky. And if you live in the right place, they're easily visible to the naked eye. Unfortunately for those of us who live in the United States, the Eta Aquarids are most visible in the Southern hemisphere — that is, south of pretty much all of us. If you live in the southern United States, though, you can still get in on the show. And even those of us who live in further north can hopefully catch something. Where Do I Need To Be To See It? Like I said, it's best to be further south for this one. If you're at Latitude 26 — think the Florida Keys or southern Texas — you probably have a pretty good shot at seeing at least a dozen meteors if you're willing to sit for an hour. If you're in New York City, or someplace comparable... well, you're probably not going to catch much. But don't fear, fellow Northerners! If you're very lucky, you might be able to catch an Earthgrazer. Earthgrazers are meteors that don't properly enter the atmosphere, but sort of skim the top of it before continuing on their way. They're rare but beautiful — and sometimes are even colorful. Worth the chance? That's up to you. Whatever region you live in, though, it's best to try viewing the shower as far from light pollution as possible — so if you're in NYC, you're probably screwed regardless. The meteor shower is set to reach peak activity on the night of May 5 starting around 10 p.m., East Coast time, with the best viewing opportunity probably being the pre-dawn hours on the morning of May 6. The Eta Aquariids are visible to the naked eye, so you don't need any special equipment to see them. They'll be show up in the east — near the constellation of Aquarius, if you're familiar enough to pick it out. And if you're watching, it pays to be patient. The meteors will likely come in spurts, so if you don't see any for a while, you shouldn't give up. So there you have it. Basically, if you're lucky enough to be in the Southern hemisphere right now, you should definitely take advantage of this time to look up at the sky; even if you're not, though, it might still be well worth your while to get up a little early or stay up a little late, fix your gaze on Aquarius to the east, and enjoy the wonder of the night sky. Because it's not every day that Halley's Comet puts on a show like this. Plus, the comet itself won't even be back until 2061.